The difficulty in spotting minute amounts of disease circulating in the bloodstream has proven a stumbling block in the detection and treatment of cancers that advance stealthily with few symptoms. With a novel electrochemical biosensing device that identifies the tiniest signals these biomarkers emit, a pair of NJIT inventors are hoping to bridge this gap. Their work in disease detection is an illustration of the power of electrical sensing – and the growing role of engineers – in medical research. 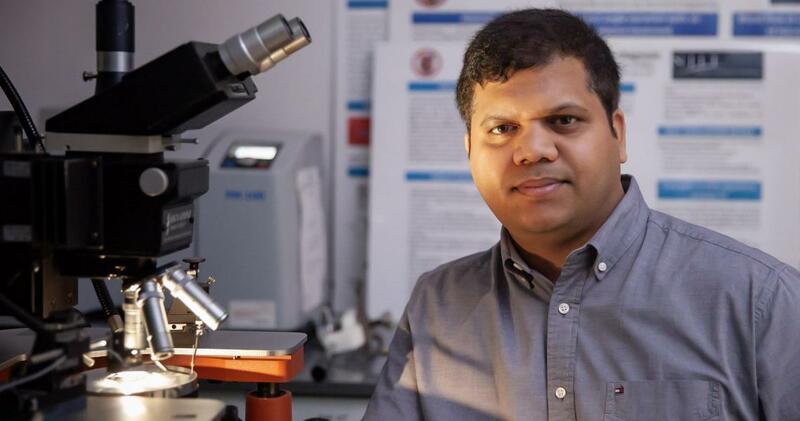 “Ideally, there would be a simple, inexpensive test – performed at a regular patient visit in the absence of specific symptoms – to screen for some of the more silent, deadly cancers,” says Bharath Babu Nunna, a recent Ph.D. graduate who worked with Eon Soo Lee, an assistant professor of mechanical engineering, to develop a nanotechnology-enhanced biochip to detect cancers, malaria and viral diseases such as pneumonia early in their progression with a pin prick blood test. Their device includes a microfluidic channel through which a tiny amount of drawn blood flows past a sensing platform coated with biological agents that bind with targeted biomarkers of disease in body fluids such as blood, tears and urine – thereby triggering an electrical nanocircuit that signals their presence. One of the device’s core innovations is the ability to separate blood plasma from whole blood in its microfluidic channels. Blood plasma carries the disease biomarkers and it is therefore necessary to separate it to enhance the “signal to noise ratio” in order to achieve a highly accurate test. The standalone device analyzes a blood sample within two minutes with no need for external equipment. Nunna is now a postdoctoral research fellow at Harvard Medical School, where he is expanding his expertise in microfluidic platforms, using them in organ-on-the-chip research conducted with Su Ryon Shin, a principal investigator and instructor in the medical school’s Department of Medicine who develops 3D-bioprinted organoids – artificial organs composed of cultured cells within structured hydrogels – for medical experimentation. “I’m primarily responsible for developing the microfluidic devices that will automate the process of bioprinting 3D organs that will be incorporated on a chip for a number of purposes. I’m tasked, for example, with developing an automated platform for long-term drug efficacy and toxicity analysis to track liver cancer and cardiac biomarkers. I’ll be integrating the microfluidic biosensor with the liver cancer- and heart-on-a-chip model for continuous monitoring,” he says. Nunna says his research at Harvard Medical School will expand his knowledge of programmable microfluidics and precise electrochemical sensing techniques, which will in turn help him advance his biochip technology. The goal is a simple, standard assay for cancer diagnosis that avoids conventional, complex diagnostic steps. Lee and Nunna have been working with oncologists at Weill Cornell Medicine and Hackensack Medical Center to identify clinical applications. As currently designed, the device would provide both qualitative and quantitative results of cancer antigens in blood samples, providing information on the presence and the severity of the cancer. Their next step, he says, will be to expand the platform to detect multiple diseases using a single blood sample obtained with a pin prick. Nunna is the co-founder and chief research scientist for Abonics, Inc., a startup formed by Lee to commercialize their device. He is named as a co-inventor with Lee on three published biochip patents and six additional patents that are now under review by the U.S. Patent and Trademark Office. Their technology has won financial backing from the National Science Foundation I-Corps program and the New Jersey Health Foundation (NJHF), a not-for-profit corporation that supports top biomedical research and health-related education programs in New Jersey. In 2017, Nunna received the “Best Design in Healthcare Innovations and Point-of-Care Innovations Award” at the Healthcare Innovation and Point-of-Care Technologies conference from the Engineering in Medicine and Biology Society, held at the National Institute of Health headquarters in Bethesda, MD. That same year, the technology received the national innovation award at the TechConnect World Innovation Conference and Expo, an annual gathering of technology transfer offices, companies, and investment firms who meet to identify promising technologies from across the globe.